So, im trying to add a weapon on my character skeleton via socket. 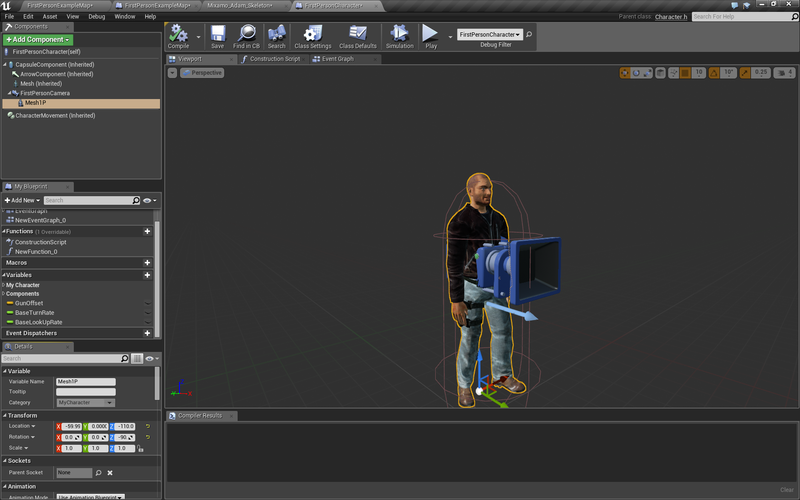 Looking at the skeleton of my character, the weapon is in place in the socket i made on his right arm. The blueprint is the same as in the video tutorial i linkd. But when i play the game, the weapon do not show in my characters hand. Posting some pics on everything that has to do with this little experement. Whould love if someone could give me a tip on what is or could be wrong. Again, i followd the tutorial to the letter, but my weapon is not showing on the character when i play. Im looking for some tips on what the problem could be so i can fix it. Once you added the weapon to the skeletal mesh, did you un-check Visible or did you select Hidden in Game underneath the Rendering tab? This section shows up within the character blueprint, within the viewport tab. I looked into it and no it wasent any of that. 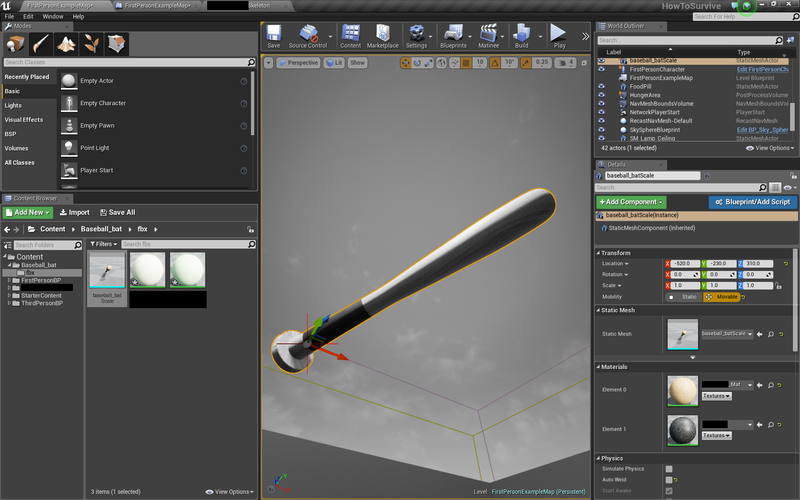 The wierd thing is, my skeletal mesh seems to have the weapon added. But when i look at my character on the viewport, the weapon dosent even show up there. The problem can be that somehow my character can't update the skeletar mesh to show that the bat has been added. 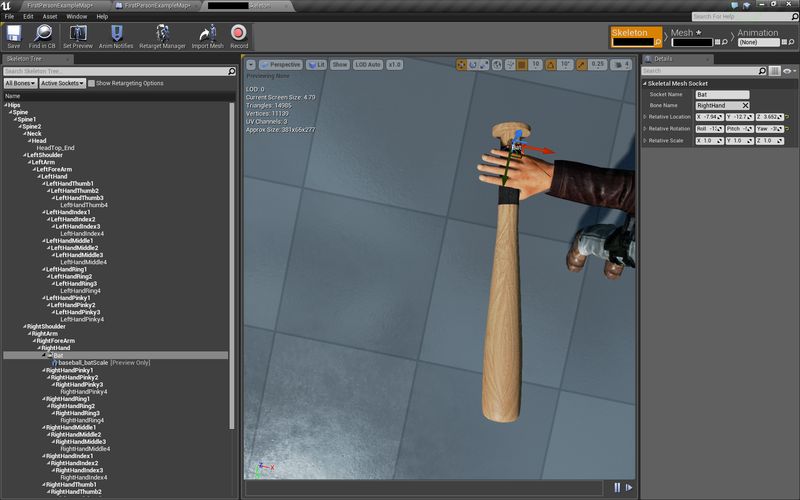 Or it is the blueprint from the tutorial that cant move the bat on the level, to my characters hand. I did try this on the third person template thou.. and it did work there.. I have a feeling that i have to redo my character to make this work. From the image that you submitted, it looks as though the bat isn't even included. 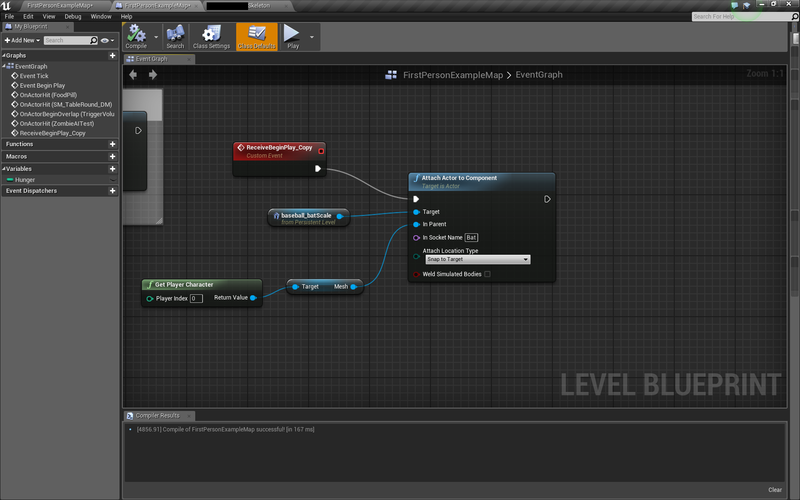 Have you looked over this Unreal Engine Documentation prior to watching the tutorial? Keep in mind that the weapon needs to be a static mesh component that you'll be adding to your character. Which within the viewport, you'd click on 'add component' and select 'static mesh'. Here is another AnswerHub that had the same question. I haven't heard from you in quite a few days. For tracking purposes, I must close this thread at this time. However, if you have any further questions regarding this specific topic, please do not hesitate to reply back. For any other questions, please submit a new question to AnswerHub!